Learn to be happy through positive thinking. Positive affirmations are things you say and do to make yourself feel better. They heal your body from the inside out by targeting your mind. Everything else has a trickle effect. 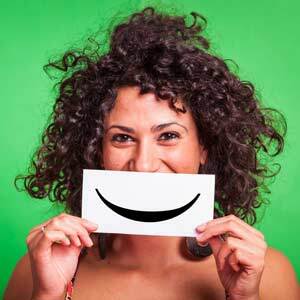 If you're happy on a subconscious level, the rest of your body follows suit, and you feel healthier. If you’re interested in the power of positive affirmations, take a look at these five ways to implement them into your life. The best way to keep your mind positive if to give yourself constant reminders. Come up with a list of positive affirmations and hang them around your home and at work. Make sure to put them in places that you look all the time. For instance, your bathroom mirror is the perfect place to hang positive affirmations because you look there first thing in the morning as you’re getting ready for the day. Another way to use positive affirmations is to repeat them to yourself when you feel discouraged. Use the same positive affirmation and say it until you start feeling better. This usually takes at least three times. If you have a go-to phrase in your mind when you’re feeling sad, you can more easily turn your thoughts into happy thoughts. And, when you're happy, it's easier for your body to be healthy. If you’re having trouble getting your mind in a happy place by saying positve affirmations, talk to an online psychic. Psychics can help you take an objective view of your life so you can find happiness. Feeling depressed takes a toll on your body mentally and physically. You need to keep your mind happy so that your body can be happy, too. A psychic can help you come up with effective positive affirmations that perfectly suit your situation. Meditation is a way to ground your thoughts and feelings so you can focus on the positive things in your life. Find a quiet place where you can be alone, then relax and try to sort through your thoughts. Everything you think about should be turned into something positive. Meditation clears your mind and relaxes your body. When you’re done meditating, you should feel better on the inside and out. When people around you are negative, their thoughts can rub off on you. That’s why you should surround yourself with happy people who use positive affirmations, too. They can show you what works best and help you be happy. Implement positive affirmations into every part of your life — friends, family, work, school, and play. If you find yourself feeling sad and discouraged at times, you should try to add positive affirmations to your daily routine. They can heal you both mentally and physically. An authentic psychic can help you if you don’t know how to get started. *Psychic Source's advice does NOT replace a professional medical provider's.